Gene deletion in C. parapsilosis. 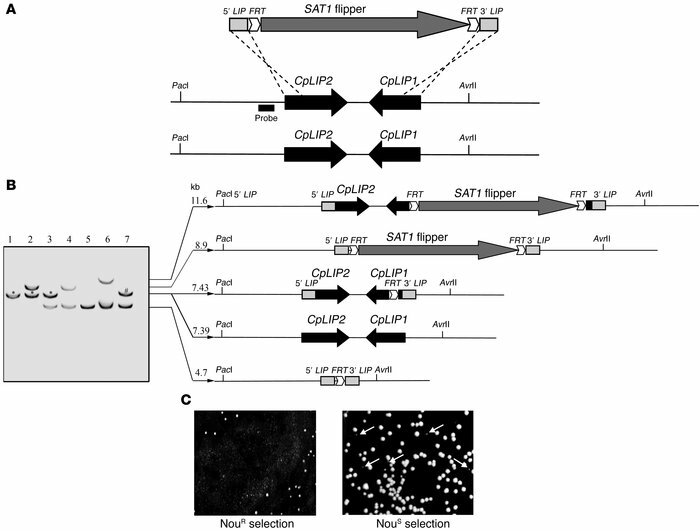 (A) Design of gene targeting for the C. parapsilosis lipase locus showing the SAT1 flipper cassette with the homologous C. parapsilosis lipase fragments 5′ LIP and 3′ LIP as well as the FLP recombination target sequences (FRT). The probe used to verify correct integration and deletion of the SAT1 flipper by Southern blot hybridization is represented by a black bar. (B) Southern blot hybridization analysis of genomic DNA (PacI, AvrII, double digested) isolated from the WT GA1 (lane 1), the heterozygous mutant CpLIP1-2/Δcplip1-2:SAT1-FLIP (HebFLP) before FLP activation (lane 2), the heterozygous mutant CpLIP1-2/Δcplip1-2:FRT (HE) after excision of SAT1 flipper cassette (lane 3), the homozygous mutant Δcplip1-2/Δcplip1-2:SAT1-FLIP (KobFLP) before FLP activation (lane 4), the homozygous mutant Δcplip1-2/Δcplip1-2:FRT (KO) after excision of SAT1 flipper cassette (lane 5), the reintegration mutant Δcplip1-2/Δcplip1-2/CpLIP2:SAT1-FLIP (RebFLP) before FLP activation (lane 6), and the reconstituted mutant Δcplip1-2/Δcplip1-2/CpLIP2:FRT (RE) after FLP activation (lane 7). Diagrams of the structures and size of the hybridization fragments are shown at right. (C) Nou selection of caSAT1-containing (NouR) transformants (left) and screening for NouS colonies after FLP activation (right). Arrows indicate small NouS colonies.